Time for another trip to Andalusia! plaza was in full fiesta mode because there was a flamenco dance festival going on! I watched the rest of the performances, including 2 cute performances by little girls and boys. Afterwards, I checked into my hotel and luckily ended up being on the top floor and thus avoiding a lot of noise. I then headed back out and bought some ice cream and walked around for a bit near the plaza. There were so many college students and everyone was dressed so stylishly! Around 12 a.m., I called it a night and headed back to the hotel. The next morning, I woke up and the first thing I did was look out the window. The Weather Channel told me that it was going to rain all weekend, but I kept hoping it was wrong, but no, it was drizzling. I got ready and around 9:30 a.m., it was time to head out. The first place I went to was the the Synagogue in the Jewish part of Cordoba (no longer strictly Jewish, the name is leftover from the Middle Ages). This synagogue was built in 1315 and is one of the best preserved synagogues in Spain. It was built collectively by Christian, Jewish and Muslim (Mudejar) craftsmen in an effort to promote religious tolerance. What is interesting is that among the flowered and geometric patterns on the wall, there are written lines which look Arabic, but are actually Bible verses in Hebrew! It is very interesting to see. After looking around fairly quickly,I started to simply walk around the Jewish quarter, taking in unique characteristics such as narrow streets, cobblestone drainages, patios decorated for the upcoming patio festival, and stone bumpers to protect buildings made from old roman pillars. It felt like a charming little town. I also found the statue of Maimondes, a Jewish philosopher/doctor/writer/theologist who was extremely famous in his time for his written works. I rubbed his foot as many people do so that his genius and wisdom will "rub off" on me. I also peeked into many beautiful patios which were overflowing with flowers and fountains! I then headed to Casa de Sefarad, a museum dedicated to Cordoba's Sephardic past (meaning Jewish people originating in Spain). I learned more about Maimonides, Jewish holidays, and the daily life of the Jewish community in ancient times. I believe it was after walking through this museum that I really began to understand Spain's diverse history. It is quite different from the rest of Europe, and although I knew that before I arrived in Spain, I feel as though I've finally realized it. Spain is truly a mixture of and influenced by a past consisting of Jewish, Moorish (Muslim) and Christian influence—especially in Andalusia. What is interesting is that all of these different groups of people ended up being in Spain for many, many generations and became a blend of each other and intrinsic Spanish characteristics. You end up with a completely unique nation and culture. I was a little bit lost at this point, but kept wandering until I eventually found my way back. I had bought a few things and I wanted to make sure they didn't get wet so I headed back to the hotel. I had also purchased a speciality cake called Pasteleon Cordoba for my Spanish family and I really didn't want to walk around with it. It was about 2:00 p.m. by this point and I was actually feeling pretty tired from all the walking and maneuvering in the rain. I let myself rest for about 15 minutes before it was time to go to the Mezquita- the main attraction in Cordoba. The Mezquita is a church turned mosque turned church, depending on who was ruling at the time. When it was a mosque, it was the center of Western Islam, and a cultural capital which rivaled Baghdad and Istanbul. 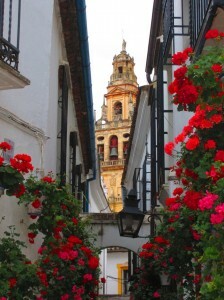 It is a perfect peek into 10th century Islamic Cordoba. I had another gasping moment when I walked it because the architecture is phenomenal and it's huge (In its heyday, it fit 40,000 people) ! The best part is the Mihrab—the main "altar" in the mosque. It was beautiful. 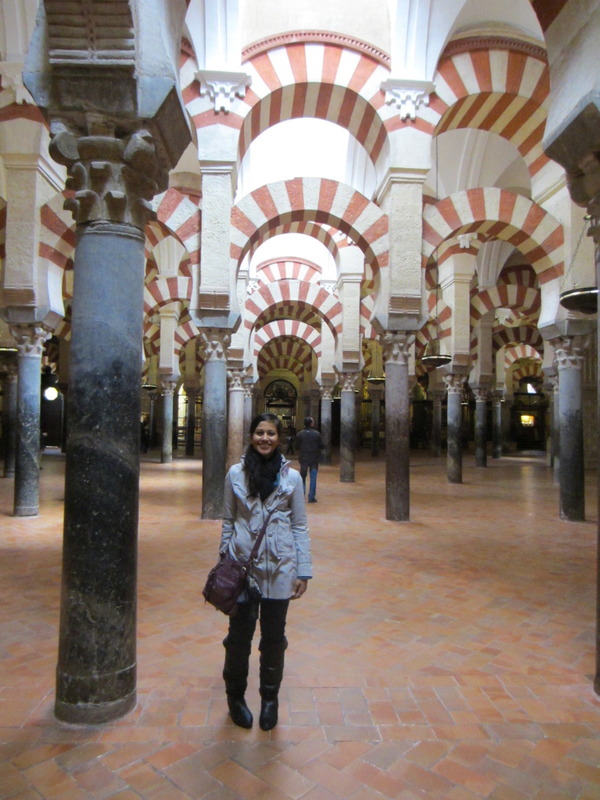 What is super interesting is that smack dab in the middle of this mosque is a Cathedral! Once you walk into it, you forget that just a second ago, you were in a mosque. As always it was very grand and powerful. I think the contrast between the mosque and the church is the most interesting part. While the Mosque embodies an intimate, bright, loving atmosphere, the Church embodies a vast, powerful, fearful atmosphere. This is just my opinion, but it's quite the contrast. Please visit and let me know what you think too. I left the Mezquita and headed towards the Guadalquivir River (if this sounds familiar its because its the same river from Sevilla). There is another Roman Bridge with a few interesting sights such as the Triumphal Arch and Plague Monument. 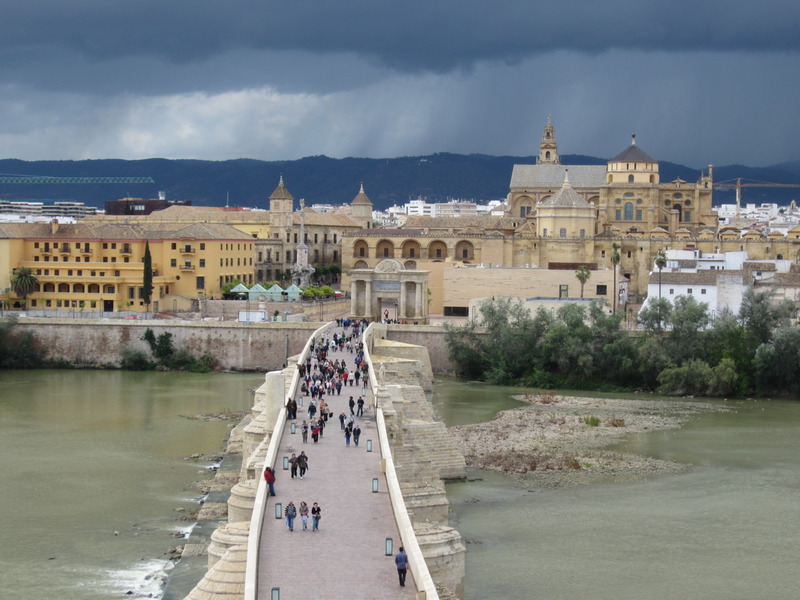 After peeking around at those, I crossed the bridge and headed to the City gate turned Museum of Al-Andalus Life which is a look at the Muslim-Moorish culture of Cordoba. It runs completely on an interactive audio guide and was entertaining. It also had a fantastic view of the city from the roof, especially with the storm overhead. By now, it was about 6 p.m. and I realized I was pretty hungry and really in the mood for coffee due to the weather. There was a cafe called La Gloria near my hotel (recommended by Rick Steves) that I wanted to try so I trudged through the rain until I found it. It is decorated with a bunch of posters of past fairs and bullfights in Cordoba among other pictures. Lots of things to look at. Ordered the usual (cafe con leche- coffee with milk) and also ordered pan con aciete y tomate (bread with olive oil and tomato), a super typical Spanish dish. It was a nice snack to hold me over until the evening, when I would be going on a guided tour of the city. I was still super exhausted so I went back to the hotel and rested for about an hour, reading, and semi-sleeping. Around 8 p.m., I realized I wanted to explore some more, and I promptly headed back to the Jewish Quarter and walked around. I didn't bring my umbrella this time because the sky looked a nice clear blue, but that was a mistake. It started sprinkling, and then full on raining, as I tried to quickly find my way back to the hotel using my more-soaked-by-the-minute map. In the room, I had less than five minutes to dry off, grab my umbrella and meet my tour. The tour, despite all of the rain, was nice. We walked through various parts of the city learning about the history of Cordoba before heading to a restaurant for some tapas. Two other young women (who I later found out were both doctors) from the U.A.E. and I were the only English speakers and so I ended up sharing a table with them. I ordered Salmorejo without the ham, a specialty of Cordoba. It was yummy! Very flavorful and at the same time weird because its a cold soup. I'm just not used to my soups being cold. Afterwards it was definitely time to call it a night and I headed back to the hotel. What a beautiful city!